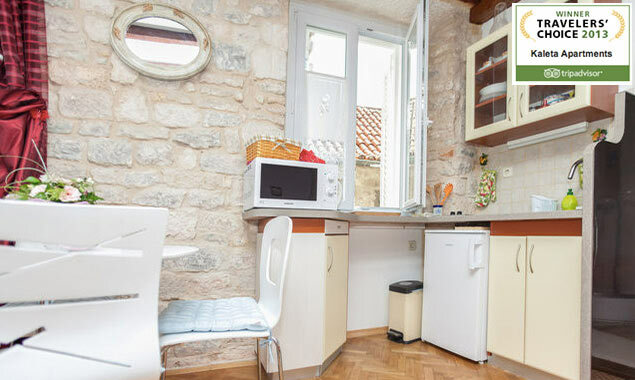 Accommodation Split Croatia | Kaleta Apartments"
Accommodation in Split Croatia, the Kaleta Suite is a single room accommodation in Split historic center. This marvellous accommodation in Split Croatia has a single bedroom with a king size bed, and sofa set with an extra bed inside. Modern convenience accommodation in Split Croatia at affordable price is well appointed with carefully preserved old world ambience, combided with beautiful bathroom and bedroom. The location is perfect in the center of historical Split of it all. Other features included a small touches that makes a huge difference - kitchenette with utensils, microwave oven, electrical kettle, use of a laptop, unlimited high speed internet access with the WiFi, satelite, LCD TV, well-stocked bathroom with hair dryer, air conditioning room, design linen, four pillows, extra blankets, local artwork, etc. "KALETA APARTMENT WAS WELL-SITUATED AND WELL-MANAGED"
We stayed in the Kaleta apartment for five days. We chose it because Rick Steves suggested it and we have found that his suggestions are always spot-on. 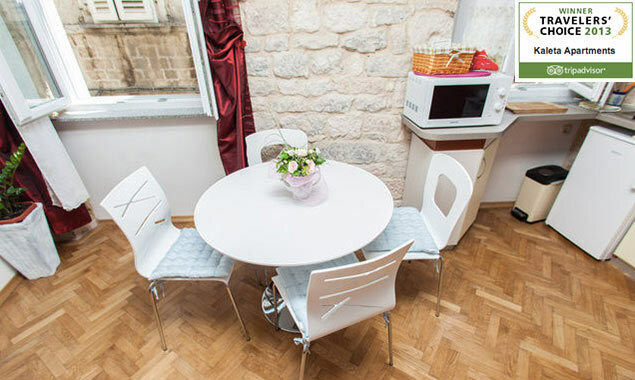 We like staying in the middle of cities and the apartment is situated near the heart of Split's 'main square,' that is at the heart of the ruined Diocletian's Palace. Though the apartment building is old, the apartment was remodeled and up to date. The purple tiled bathroom was clean and very convenient. The apartment's windows were so thick that they blocked out all the sound/music from the tavern below. The owner put a lot of consideration here for the guests who booked this place to have a restful, quiet night. Davo-the young man who welcomed us was charming and helpful in every way. Negri, the owner (who we did not meet) was eager to help us (through Davo's conversations with her) and followed through with little requests. In particular she arranged a taxi driver for us to get to Split's airport at 4:45 am. We would highly recommend Kaleta to anyone. Excellent location and appearance of kaleta apartments makes me feel to visit again.The apartment portraits the history with modern facilities.All rooms were spacious, clean, well decorated and well equipped. Great location right inside Diocletian's palace. Took the bus from airport and dropped us off at the port which is a 10 walk if you walk really slow. Not difficult to find with the map that they sent us. We were just walking on the street looking for the apartment when Dado met up with us and led us the rest of the way. He brought us into the apartment, showed us how everything worked and even gave us suggestions on things to do and where the locals eat. Very clean and tastefully decorated. Looks just like the pictures on the website. We arrived very late at night after a delayed flight from London and Neno met us and showed us to the apartment - right in the centre of the old town! The location was absolutely amazing!! The room was spacious and clean and had a large bathroom and kitchenette...there was also a comunal lounge area with free internet and lap top. Neno was really helpful and a great asset. Definitely would come back again!. Communication with Kaleta Apartments was very good and they arranged a taxi to pick us up at the airport, which was excellent, as we got into Split very late. 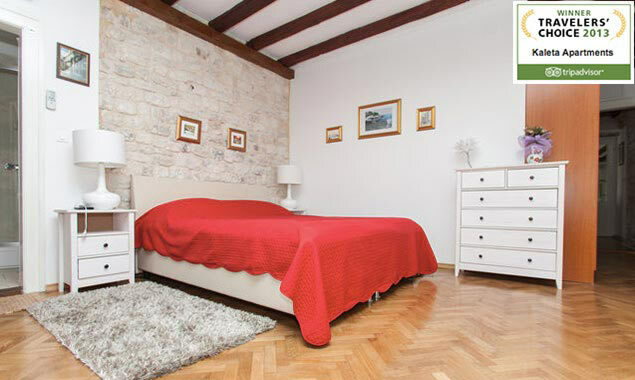 The apartments are perfectly located inside Diocletian's palace, and are both comfortable and characterful. It was probably the best value accommodation we had during out entire trip.The soundproofing was very good, as there was a very loud bar (Ga Ga) nearby, which we could not hear, and it is perfectly located to explore the wide variety of bars and restaurants in the palace. It was also a reasonably short trek, with luggage, down to the port, for connections to the islands. "GREAT LOCATION, SERVICE AND ENJOYABLE STUDIO APARTMENT"
Stayed here 2 nights. Very helpful host, met us with bags at internet cafe close to studio. Helped us find car rental pickup point. Great being able to have internet even with computer in room to use. Location walkable aroundSplit with ease, really enjoyed it all, quaint little studio, though there are more than studio's available. Some stairs but not many and easy to navigate - that was good. We stayed at the Kaleta Apartments for two nights in June, and I would recommend it to anyone who is looking for a great place to stay in Split for a reasonable price. The location inside of Diocletian's Palace can't be beat, the room was lovely and included a kitchenette, and Neno was very kind and helpful. If I have the pleasure of going back to Split, I would definitely stay here again. "CLEAN, HOMELY, OLD TOWN LOCATION!" Stayed here for 3 nights in July and really must agree with majority of reviews on here. This was a fantastic place to stay. We had Apartment 5 and although the initial walk to it got us a bit nervous (it was down a dodgyback alley) when we got to the apartment really we were delighted. We were given a VERY warm welcome and really the owner could not do enough for us. The apartment was very clean, fantastically decorated with mini Kitchenandutensils. There were also supplies of tea and coffee for us to use (as well as some local spirts for us to sample). Everything in this place looked brand new but really it is the location that is the winner here! Right in the heart of the old town within the city walls!! Air con worked very well and WiFi was available to use at all times. I would say if you are visiting Split and you want a safe, modern apartment with location to make you smile and an owner who clearly loves what they do please book here. "GREAT APARTMENT IN THE PALACE!" We were really glad we chose to stay inside the Palace walls. It is really beautiful and has shops and restaurants right outside your door. The Kaleta apts were great. Nino had a driver meet us at the airport and took us directly to the room. It is decorated very nicely and has a kitchenette and fridge. It was clean and comfortable and we would definitely stay again. My fiancé and I had the pleasure to stay here during our recent trip to Split. True to all the favourable reviews we have read on this site about the apartment, we were impressed with the room that we were given. Firstly, thelocation of the apartment is fantastic, as it is located within Diocletian's palace itself (inside the city centre). Hence getting to the apartment was not a problem if you arrive in Split by bus or ferry, as it is near the main bus station and the ferry terminal. Moreover, we really liked the convenience of heading back to our room to rest our weary feet whenever we like to, during the day. And since it is located in the city centre, everythingyou possibly need (eg. Supermarket) is within reach and you can also stay out till the wee hours without any possible worries about returning home late. Although the room that we had was above a cafe bar, the room was rather sound-proof so it was not noisy at night. The room we had was beautifully decorated (we liked the rustic old walls), smelt lovely (even the toilet and the bed sheets! ), and very clean. Besides having free wifi and a nice tv (where we caught the Euros 2012), our room was even equipped with a laptop, a mini kitchen, a mini bar, and some magazines. The owner of the apartment, Neno, was also very easygoing and accommodating, and easily contactable via email. Overall, we were very happy with our stay here (can't think of any complaints) and we would highly recommend this place if you visit Split. 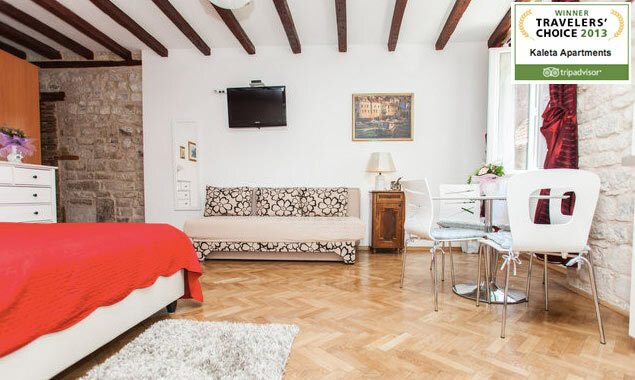 "PERFECT LOCATION, EXCELLENT CUSTOMER SERVICE"
My husband and I just returned from our visit to Croatia, and we couldn't have been more pleased with this apartment. The location is ideal just inside the walls of Diocletian's Palace. We didn't realize how nice it would be to be able to stop by our room any time we needed to. The Raic family is very, very helpful. The airline lost our luggage and they were so helpful to take my husband to the airport to pick up his and show me where the mall was when mine didn't come. The room had so much character and charm too. One thing that I found particularly helpful was that the room not only had wifi, but there was a laptop there for your use. We didn't travel with a computer or anything, and we really needed the internet to figure out our luggage situation. I highly recommend staying here. "GREAT PLACE TO STAY IN SPLIT!" This apartment was one of the best places we stayed in during our entire two week Europe trip in May. Location was ideal, furnishings were in good condition, kitchen was well-stocked, bathroom was nice. Owner had lots of little extras including figs and grappa, dish of what my Italian mother-in-law called "ribbons, sleeping mask, packs of ready-to-make cappuccino--the list goes on and on. Also, nice to have was the common room with books and laptop. Owner was also very helpful with suggestions of places to eat. Lots and lots of attention to detail. You will not regret staying at Neno's apartment. Modern convenience in the middle of historic old town. Great Apt., clean, modern amenities and in a vibrant location. You are literally steps from everything. Owner could not have been a better intro to Croatian People. Best value of our 2 weeks in Croatia. 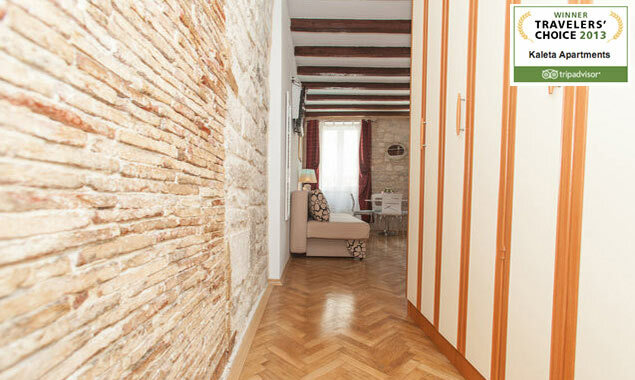 "BEAUTIFUL, HOMELY APARTMENT IN SPLIT! I LOVED IT!" I loved this studio apartment! The apartment was fairly easy to find in Split. On arrival we called the owners number and he appeared within five minutes. He explained some of the history of Split, the Diocletians Palace and the building we were staying in. The apartment was absolutely beautiful. Clean, homely and cosy! The bed was one of the comfiest I have slept in; the linen clean and crisp and the pillows plump. Every aspect of the apartment was thought out and decorated with lovely ornaments and paintings. The bathroom was clean and bright with a very powerful shower. There is an entry room which was a communal room for all the apartments. This contained a laptop which guests were free to use as well as there being free wifi. The owner had also provided dried figs and homemade liquers. I'm sorry we only stayed one night because I loved this apartment. Marvelous accomodation; convenient and comfortable, exceptional host. A lucky find for us because of a cancellation by other guests. We will send a lot of friends here in the future. Great location, friendly service, clean apartment. Loved my time at this apartment!! Wish we had stayed longer. We stayed only one day and we didn't want to finish of this dream. The smell and atmosphere of the room are different from what you ever see.Helpfull owner, very clean room and best location. Apartment Kaleta is an excellent place to stay in lovely Split. The apartment room is tastefully-decorated and designed, very clean, fresh, comfortable, well-equipped, a good size, with great WIFI. Its location is great -down a quiet, private lane, only a couple of minutes walk to all the tourist sights in the palace. It's 5 minutes down to the water's edge. The owner is very friendly and helpful and made us feel very comfortable and although he does not live at the apartments, it was no trouble contacting him if needed. They also provide plenty of maps and brochures etc on Split and have a great recommendation for a restaurant around the corner. On top of all that, the price is excellent and you get great value. Enjoy! (On booking.com, the apartments are called Apartments Piazza). "TOP LOCATION AND VALUE FOR MONEY"
My husband and I stayed in Kaleta apartments for the first time in August 2010. The apartment was beautifully appointed and very clean. Internet access was a great bonus. The location is top notch, right in the middle of the old town. Yes, it is above two busy cafes but the windows are awesome and they cut out all of the noise as soon as you close them. The owners were very kind and helpful in communicating over email prior to our arrival. The best of all is value for money - for a similar room in a hotel in the old town you would pay at least 3 times the price, so the value is unbelievable. We are going back to Croatia this year and just made arrangements to stay in Kaleta again! 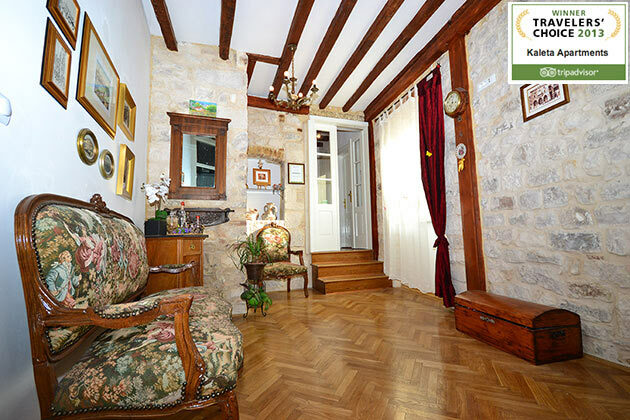 Perfect apartment in the centre of the old town. The apartments are modern and beautifully decorated you couldn't wish for anything else. Selected 20 reviews on this page.